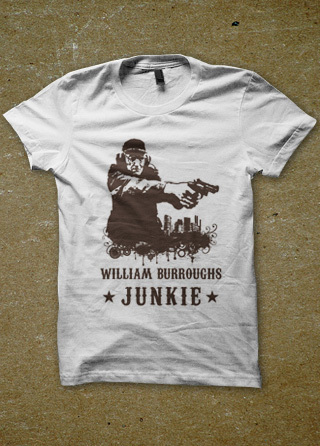 Printed mens t shirt of William Burroughs ‘Junkie’ design. William S. Burroughs, was one of the three seminal writers of the Beat Generation (the other two being his friends Jack Kerouac and Allen Ginsberg). Created the “cut-up” style of writing along with Brion Gysin, in which sections of a story are cut up and reassembled to create a new story. This technique is similar to the “tape collage” style of experimental music, which Burrough was known to dabble in. 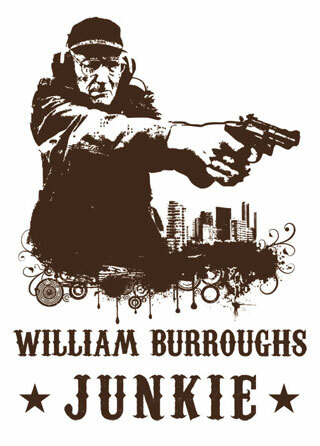 Famous for writing books such as ‘Naked Lunch’ and ‘Junkie’. He was a good friend of Kurt Cobain. He was even asked to appear in Nirvana’s “Heart-Shaped Box” video as Jesus Christ, but later refused. He made an EP with Cobain titled “The Priest They Called Him”. 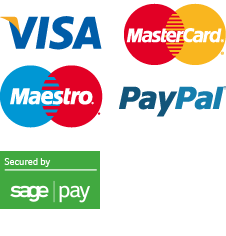 Please check the sizing chart before you buy – we have had a few returns lately due to people not taking notice of the measurements. *Please note that the photo is an image mockup and our t shirts may change from time to time according to availability from the Manufacturers.